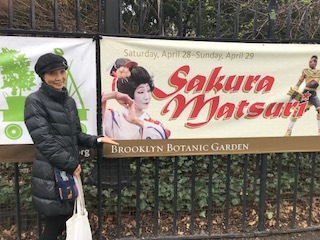 The annual Sakura Matsuri performance by Sachiyo Ito and Company at Brooklyn’s Botanic Garden cannot be compared to any other dance troupe currently in New York. Her work is a treasure and her company is incomparable in its skilled performance of the tradition of Japanese dance, nihon buyo. 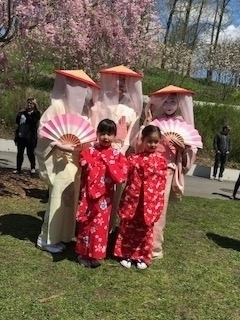 The company’s program reflected the garden festival’s homage to an annual Japanese tradition of o-hanami; welcoming springtime by admiring the colorful cherry blossom petals that were blooming in the garden. The female dance company gracefully portrayed seasonal changes with four traditional dances and a Kabuki theatrical dance highlighted by Ito’s portrayal of three comic characters with masks. Opening the program was Sakura-gari, Cherry Blossom Hunting. 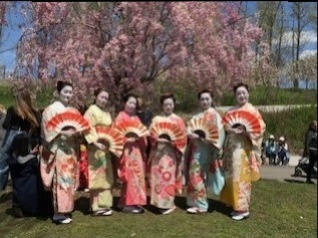 Six dancers in striking red, orange and pink kimonos, strolled down the hanamichi, a traditional Kabuki center stage extension in the front of the audience. The dancers were intricately synchronized with stylized arm and head movements, tilting and nodding as they softly tapped their long decorative sleeves with fans (sensus). The piece ended with dancers elegantly swaying branches of cherry blossoms. 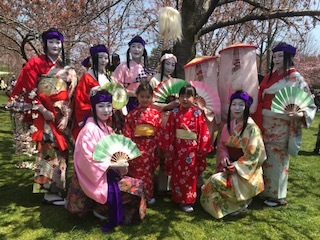 The second dance, Sakura, Cherry Blossom, by a traditional Japanese song, began with two young girls in red kimonos spreading cherry blossom petals toward the audience from the hanamichi. Ito followed them onstage with cherry branches in a solo that was intimately inviting and warm. 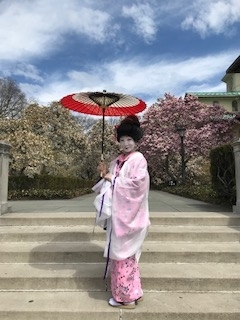 Two other adult dancers joined Ito and the trio of pale pink kimonos and headdresses with flowing veils gently portrayed the movement of floating blossoms. The charming third dance, Mitsumen Komori, Three Mask Lullaby, was a dynamic solo by Ito that highlighted her acting skills. Accompanied by music and words, her quick changes of masks and intricate body movements brought to life three distinct characters; a young maid Okame; a god of good fortune, Ebisu, who flirts with the maid; and a third religious character, Hyottoko, who overhears the couple quarreling and prays to unite them. This solo exhilarated the audience. The next dance, Soshun, choreographed by Ito, stunningly illustrated the changes in seasons, especially winter to spring. Ito’s brief appearance in the dance provided a contrast to the four adult dancers who performed with various props and fans dressed in colorful kimonos and purple headdresses. Two young girls, in red kimonos, represented adolescence. In a poignant moment, one girl gestured to the other and together they gracefully followed Ito offstage. The final dance of the program, Genroku Hanami Odori, a danced celebration of people enjoying flowers, featured six dancers in colorful purple kimonos skillfully displaying the techniques of various props, head movements, formations, rhythmic patterns and fans.